Jesse Pender, veteran and chef. 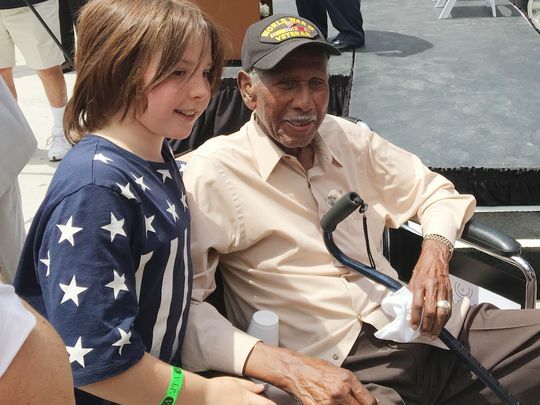 In 2011, a Palm Springs, California, news reporter interviewed Wilson native Jesse D. Pender Sr., then 96, about his World War II service, his early work for a brothel keeper, and his years cooking for a president. The Desert Sun, 4 December 2011. In the 1920 census of Goldsboro township, Wayne County: farmer Joseph Pender, 49; wife Ella L., 42; amd children Edward D., 14, Maggie, 9, Ernest, 12, Alonzo, 7, Jesse, 4, Georgiana, 3, and Josephine, 1. 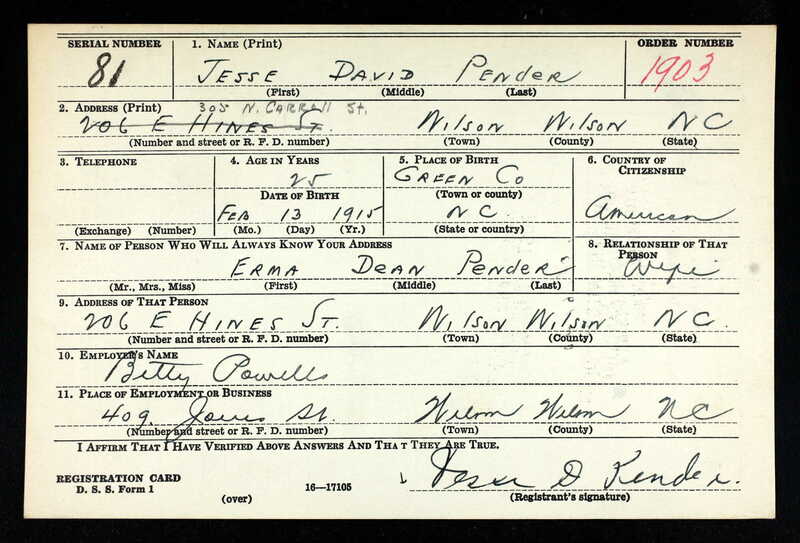 On 29 December 1937, Jesse Pender, 23, of Wilson County, son of Joe and Ella Pender of Wilson County married Erma Dean Hines, 18, daughter of Louis and Martha Hines of Wilson County, in Nashville, Nash County. In 1940, Jesse David Powell registered for the World War II draft in Wilson. Note his employer. Betty Powell made out her will in March 1945. After disposing of bonds, bank accounts, real property and jewelry, she bequeathed “all the residue of my estate to Jesse Pender and all of the girls including my maids, that may be residing with me at my death, to share and share alike.” She died just over a year later. Wilson Daily Times, 7 May 1946. Pender’s workplace before Betty Powell hired him to drive. 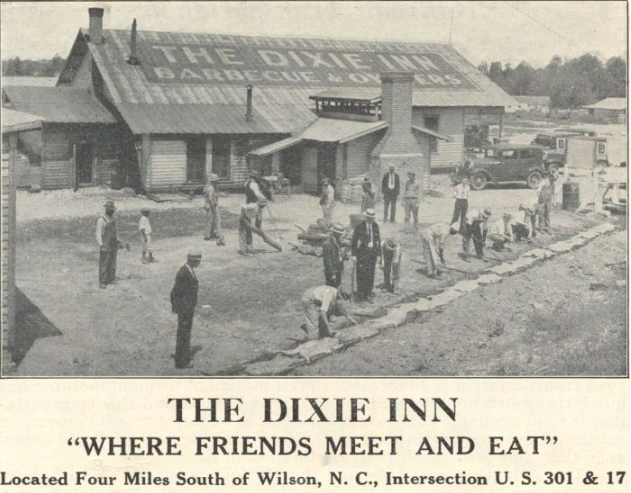 Advertisement, Facts About Wilson North Carolina, Wilson Chamber of Commerce (1934). Pender at age 102. Photo courtesy of “A Flowery Tribute in Palm Springs as Warplanes Fly in Formation in Memorial Day Salute,” The Desert Sun, 29 May 2017. Thanks to my frequent collaborator S.M. Stevens (and her grandmother Willia Jones Turner) for forwarding this clipping. North Carolina Wills and Estates, 1665-1998 [database on-line], http://www.ancestry.com. Snaps, no. 6: Jack Henderson. Like many, Jesse “Jack” Henderson, a Wayne County native, was drawn to Wilson in the booming years after the establishment of the city’s tobacco markets. His uncle and aunt, Jesse and Sarah Henderson Jacobs, had preceded him, and he joined their household on Elba Street in East Wilson. In the 1910 census of Wilson, Wilson County: Jesse Jacob, 53, deliveryman for stable; wife Sarah, 35; daughter Annie Belle, 15; and boarders Jesse Henderson, 17, Herbert Jones, 23, both stable laborers, and Nina Fasin, 32, a housemaid. Jack Henderson, right, with a friend and dog, around 1910. The 1916-17 Wilson city directory lists: Henderson Jack lab h 219 1/2 Pender. Jessie Henderson registered for the World War I draft on 5 June 1917. Per his registration card, he was born 1893 in Mount Olive, North Carolina; resided at Pender Street, Wilson; and worked as a transfer driver for Sam Vick, Wilson. He had a wife and 2 children and was described as tall and slender with brown eyes and black hair. He signed with an X. The 1918 Wilson city directory lists: Henderson Jack chauffeur ZF Gill h 217 Pender. In the 1920 census of Wilson, Wilson County: at 217 Pender Street, Jesse Henderson with wife Pauline, daughter Bessie, and mother-in-law Alice Artis. Jesse worked as a truck driver for a woodyard. Alice was a cook for a private family. In the 1928 Wilson city directory: Jack Henderson, a driver, and wife Pauline, were listed at 318 Pender Street. Around this time, he posed with his oldest daughters, Bessie (1917-1996) and Alice (1920), for this photograph. In the 1930 census of Wilson, Wilson County: at 318 Pender Street, Jack Henderson, 38, wife Pauline, 31, and children Bessie, 12, Alic, 10, Joice, 7, Mildred, 6, and Archy, 4, mother-in-law Alic Artis, 49, paying $18/month rent. Alice worked as a cook for a private family, and Jack as a truck driver. In the 1940 census of Wilson, Wilson County: tobacco factory laborer Jack Henderson, 47, and lodger Pattie Barnes, 30. Per her headstone at Rest Haven cemetery, Pauline Artis Henderson died in 1950. Pattie Barnes Henderson died 13 October 1957 at her home at 900 Robinson [Robeson] Street. Per her death certificate: she was born in 1910 in Wilson to Tip Barnes and an unknown mother and was married to Jack Henderson. Jack Henderson died 29 April 1970 in Wilson. Per his death certificate, he was born 21 April 1898 to an unknown father and “Lucy (?) Henderson;” had worked as a laborer; and resided at 1214 East Queen Street, Wilson. He was buried in Rest Haven cemetery, Wilson. Informant was Mildred Hall. Jack Henderson wearing his driving gloves, probably in the 1940s. He worked many years transporting tobacco from Wilson’s markets. Photographs in personal collection of Lisa Y. Henderson.